Lauded by the New York Times as “vibrant mezzo soprano”, “dark toned, agile Mezzo soprano”, Hyona Kim joined Dortmund Opera in Germany as an ensemble singer from 2018/19 season and made her house debut singing Amneris in Verdi's Aïda. Upcoming roles at Dortmund Opera are Suzuki in Madama Butterfly (Puccini) and Fricka in Das Rheingold (Wagner). 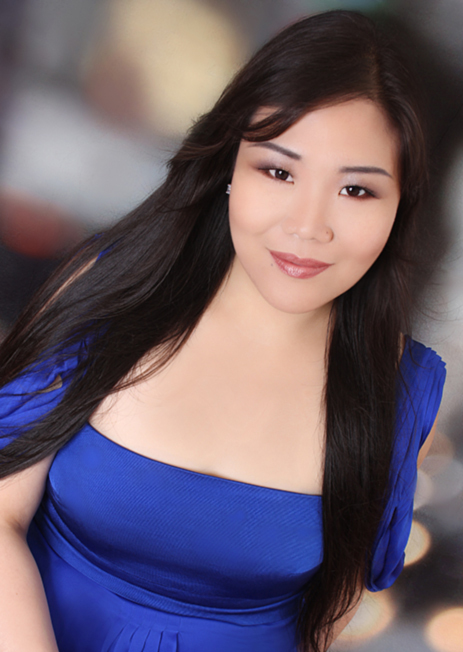 Kim made her San Francisco Opera debut singing one of the leading roles, Lady Wang in Bright Sheng’s world premiere Dream of the Red Chamber under Geroge Manahan and was critically acclaimed as “Unstoppable powerhouse” by San Francisco Chronicle, and performed the same role with Hong Kong Arts Festival under Muhai Tang. She has also sung with New York City Opera, Romanian National Opera, Cluj-Napoca, Opera Lancaster, Opera Company of Middlebury. Performed roles include Azucena in Verdi's Il Trovatore, Dame Quickly in Verdi’s Falstaff, Suzuki in Puccini’s Madama Butterfly, Hermia in Britten’s A Midsummer Night’s Dream,Wowkle in Puccini's La fanciulla del West and Olga inTchaikovsky’s Eugene Onegin among many others. Hyona Kim was a National finalist in the Metropolitan Opera National Council Auditions to perform with the Metropolitan Opera Orchestra conducted by Marco Armiliato at Lincoln Center. She also was the Grand Winner of the Joy in Singing Competition and performed the winner’s solo Recital in Merkin Concert Hall in New York City. She was a First Prize winner of the Gerda Lissner Competition, and a multiple grant winner at the Licia Albanese-Puccini and Giulio Gari Competitions. She is a grant recipient of the Olga Forrai Foundation and also has won the Jennie Tourel prize in the Poulenc Competition. She has won the Suri Competition and the Schubert Lied Competition in her native country, South Korea, where she earned her Bachelor’s degree at Ewha Womans University. She received her Master’s degree and Professional Studies Diploma from Mannes College of Music in New York City and was chosen to be the recipient of the Marian Marcus Wahl Memorial Award, awarded to a graguating singer showing particular excellence. During her time as a member of the Mannes Opera, she performed many roles with Joseph Colaneri such as Dorabella in Cosi fan tutte (Mozart), Marcellina in Le nozze di Figaro (Mozart) and Annina in Verdi’s La Traviata (Verdi), all acclaimed by Opera News. In addition to Mannes Opera, she has been chosen for many concerts such as Yearlong Festivals of Mannes under Pavlina Dokovska’s directing and was chosen to be the recipient of the Marian Marcus Wahl Memorial Award, awarded to a graduating singer showing particular excellence. Apart from Mannes College of Music, she has participated in many festivals and projects, including Aspen Music Festival, the Music Academy of the West, Israel’s International Vocal Arts Institute, the Natchez Music Festival and the Martina Arroyo Foundation. She made her Houston Grand Opera debut originating the role of Hal-Mo-Ni (grandmother) in Jeeyoung Kim’s From My Mother’s Mother at HGOco, and also has performed the lead role in Su Lian Tan’s opera Lotus Lives at Distler Hall at Tufts University in Boston. Kim has sung with the Nashville Symphony and the Sinfonia da Camera as the soloist in Handel’s Messiah and Verdi’s Requiem respectively. She made her Carnegie Hall debut with New England Symphonic Ensemble singing the alto solo in Vivaldi’s Gloria. She was the featured alto soloist in numerous concerts including performances of Bach’s St. John Passion, St. Matthew Passion, Mendelssohn’s Elijah, and Beethoven’s Symphony No.9. Passionate about chamber music and art song, Ms. Kim has appeared in many chamber music concerts and recitals with Mannes Baroque Chamber Players, the Guinnes Quartet as part of Viva Virginia, International Festival of Music, and also in several concerts of Ensemble 212, in works such as: Mahler’s Symphony No.2 and No. 3, world premieres for Chamber Orchestra both by Yoon Jae Lee, and Der Abschied from Das Lied von der Erde featured with Michael Mao Dance. She has participated in Stephanie Blythe and Alan Smith’s Fall Island Vocal Arts Seminar which only performs Art Songs by living American composers. Kim also has sung with Brooklyn Art Song Society in their concert series of Les six: Francis Poulenc and Songs of Mahler.